Small point updates to its mobile operating system often give Apple the chance to smooth the edges of its major releases, while adding a few smaller features here and there. iOS 4.1—announced last week to kick off Apple’s refresh of its iPod line—is different. This time around, Apple is putting a much greater emphasis on new features, including support for high dynamic range (HDR) photos, the new Game Center social network, iTunes TV rentals, and more. And if that’s not enough, the company also pulled back the curtain on the forthcoming iOS 4.2, which aims to finally unify the software on the iPhone, iPod touch, and iPad, and has no shortage of new features either. What can you expect when these iOS updates arrive? Here’s a rundown of what Apple’s promised to deliver with its forthcoming mobile operating system updates. Which iOS devices will support iOS 4.1? Apple says that iOS 4.1 will work on the iPhone 4, iPhone 3GS, and iPhone 3G; that suggests that it will run on the corresponding iPod touch revisions, which would be second-generation, and third-generation devices as well. The fourth-generation iPod touch—unveiled at this week’s iPod extravaganza—will ship with iOS 4.1 installed, Apple says. Of course, since this is a minor update to iOS 4, some features—multitasking, for example—are still not available on the iPhone 3G and second-generation iPod touch. And there’s one device that won’t get the 4.1 update—the iPad. Which iOS devices will support iOS 4.2? In his presentation Wednesday, Apple CEO Steve Jobs said iOS 4.2 was “all about the iPad,” delivering features specifically for that device. But Jobs also said that update would work on the iPhone and iPod touch as well—presumably the same models that will run iOS 4.1. When will iOS 4.1 be released? Will it be a free update? Apple said at Wednesday event that it would release iOS 4.1 “next week”—that’s the week we’ve just started if you don’t happen to have a calendar handy. Our colleagues at Macworld UK report that the Apple UK Website briefly listed the launch date as September 8 before quickly changing the listing back to “coming soon.” That would mean the update arrives Wednesday, which seems as good a time as any to release 4.1. What about iOS 4.2; when will it be released? Will it be a free update? You’ll have to wait a little bit longer for the iPad to finally reap all the benefits of iOS 4: Jobs said the update will drop in November, but that it too would be a free download. Will iOS 4.1 fix that annoying proximity sensor issue? What about the insanely slow performance on the iPhone 3G? If you believe Steve Jobs—and really, why wouldn’t you?—then Apple has finally squashed both of these bugs. A little background: Some iPhone 4 users have reported problems with the phone’s proximity sensor. The sensor determines when you’re holding the phone close to your face—as you would when making a phone call—and it deactivates the iPhone’s touchscreen so your cheek doesn’t inadvertently brush up against any buttons. Users with misbehaving proximity sensors say that their iPhone 4 screens remain active during calls or that the screen fails to re-activate once the call is over. Apple acknowledged the problem at a July 16 press conference and promised a fix in a future update. As for performance issues, some users with older iOS devices—notably the iPhone 3G—have complained that iOS 4 runs slowly on their handheld. Apps are slow to respond and prone to crashes. The onscreen keyboard occasionally suffers from delays between tapping a key and when that keystroke appears on the screen. Older iOS devices running iOS 4 are also prone to warming up in a hurry. Last Wednesday, Jobs said both those issues will be resolved in iOS 4.1, along with unspecified Bluetooth bugs. Of course, the proof will be in the pudding—we’ll have to wait until the update is available to see how well these fixes actually work. What is AirPlay and when does it arrive? The AirPlay feature allows you to stream music, videos, and photos from an iOS device. It’s a renamed—and more powerful—version of AirTunes, which allowed for music streaming. Jobs demonstrated the ability to seamlessly switch playback from one device to another, but only showed it for switching from iPad to Apple TV using the iOS 4.2 update. That would seem to suggest it’s arriving with the iOS 4.2 update in November. Apple’s own AirPlay Web page doesn’t shed any light on the matter. Apple promises several features in 4.1 beyond the bug fixes we’ve already talked about. The updated OS will bring the debut of Game Center, which you may recall from Apple’s spring preview of iOS 4. Game Center offers APIs for developers that will help them better implement multiplayer controls into their games. But for those of us who just play games and don’t build them, Game Center offers plenty of interesting features. For starters, it will be easy to challenge other players to games, whether those challenges go out to your friends or strangers with whom Game Center “auto matches” you. Game Center also features a number of social networking elements like leader boards and features that help you discover new games by seeing what your friends are playing. iOS 4.1 is more than just fund and games, however. Apple promises iPhone and iPod touch users will be able to rent TV shows from their device for 99 cents. iPhone 4 users will be able to upload HD video to YouTube and MobileMe from their phones. And then there’s support for high dynamic range photography. What’s high dynamic range photography? You can get an in-depth explanation of HDR and what it means for the iPhone elsewhere on Macworld.com. But in a nutshell, HDR images combine a series of photographs, each shot at a different exposure to bring out details that might otherwise not be seen in a single exposure. Apple’s version of HDR combines three images taken with the iPhone's back camera in quick succession. An HDR button to the right of the flash button in the Camera app of iOS 4.1 will let you opt to save both the HDR image and the regular photo to your camera roll or just the HDR photo. Which iPhone and iPod touch models support the new HDR feature for photos? 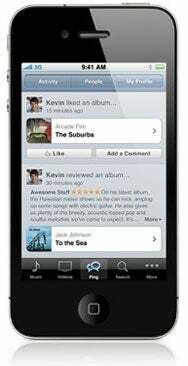 Apple suggests that the high dynamic range feature will only be available on the iPhone 4. That’s not entirely a surprise, as the device has far and away the best camera of any of Apple’s mobile devices (and most of the iPod touch models don’t have a camera at all). Is the new Ping feature included in iOS 4.1? Actually, support for Apple’s new Ping social network was secretly present in iOS 4.0 for the iPhone and iPod touch as part of the iTunes Store application, but was turned off until Wednesday's iPod announcements. Ping won’t arrive on the iPad until iOS 4.2, however. Is wireless printing available in 4.1 or not until 4.2? Jobs demonstrated wireless printing as part and parcel of the iOS 4.2 update. When will Apple support FaceTime on Macs? Your guess is as good as ours. With the iPhone and iPod touch now sporting front-facing cameras, it seems likely that a subsequent iPad revision—one that adds a camera to that device—will bring that feature to the tablet device as well. But Apple’s given no indication of when it might support FaceTime on the Mac.